Eagle River, Wisconsin. 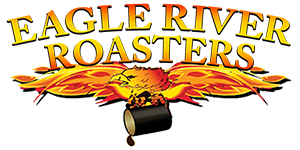 Eagle River Roasters flame roasts the world's finest specialty coffees for the freshest coffee in your cup. All coffee is available as whole beans or ground, Monday through Friday. Owners Dan and Susan Beihoff are not new to specialty food products as they also own Cranberry Gift House, a featured store in the Northwoods since 1964.